If you call someone who collects books a bibliophile – what do you call someone who collects bookmarks? I have been on a DIY bookmark kick lately. 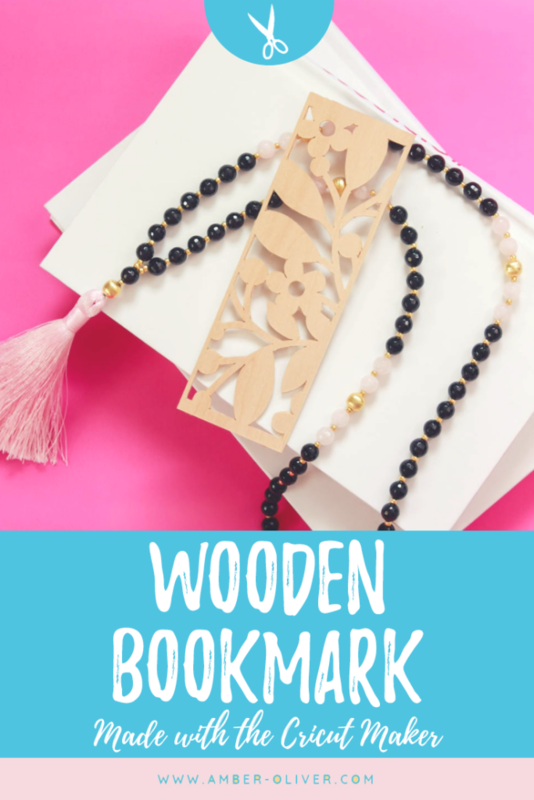 I created these beautiful resin bookmarks last week and this week I decided to try another medium: WOOD! I pulled out my Cricut Maker and used the knife blade to cut out my creation! The biggest piece of advice I can give someone started out with the Cricut Maker is to not be afraid of it. When starting a project, I’m always nervous that I’m going to mess up. Spoiler alert – you will! You’re going to forget to mirror your vinyl or select the wrong material sometimes. The good news is: Cricut is extremely easy to work with and Design Space gives you lots of hints and help along the way! You can’t cut using the knife blade from the app. Must be with the desktop version of Design Space. The cuts can take a LONG time. This bookmark took about an hour to cut. You have to tape everything down – you can’t just rely on the stickiness of the mat! That being said – you can’t use Fast Mode – so make a cup of coffee or put on your favorite show while the Maker works! 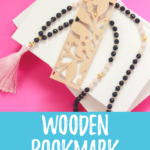 How to use the knife blade to cut beautiful wooden bookmarks from basswood with the Cricut Maker. Step 2: Decide which bookmark you'd like to cut and hid the others. Select the one you want to hide, click the 3 dots in the upper left corner, then click "hide selected". Step 3: Setup your mat where the design is on the preview screen. Step 4: Select the material you are using - I used 1/16 Basswood from JOANN. Step 5: Follow the onscreen instructions to setup your machine: move star wheels all the way to the right. Step 6: Setup your mat: use a Strong Grip mat and use tape on the edges of the wood. You can follow this guide for preparing your materials. Step 7: Lastly load your machine and press go! While the knife blade is pretty awesome, I also cut plenty of things with the other blades. My favorite thing to cut is vinyl. I love to make labels for everything from the kitchen to the bathroom. I also make everything from home items to party decor. I’ve also cut fabric using the rotary blade! What makes this machine different from others is its ability to cut 100s of materials and the expandable suite of tools (like the knife blade used on this project!) Once you get a Maker you’ll be using it all the time! I started with a rectangle and customized the size to my liking. Next, I found a design I liked and sized it to fit over the rectangle. I then sliced the image and put the sliced piece over the same size rectangle. Lastly I attached – so the design would be cut out of the rectangle! 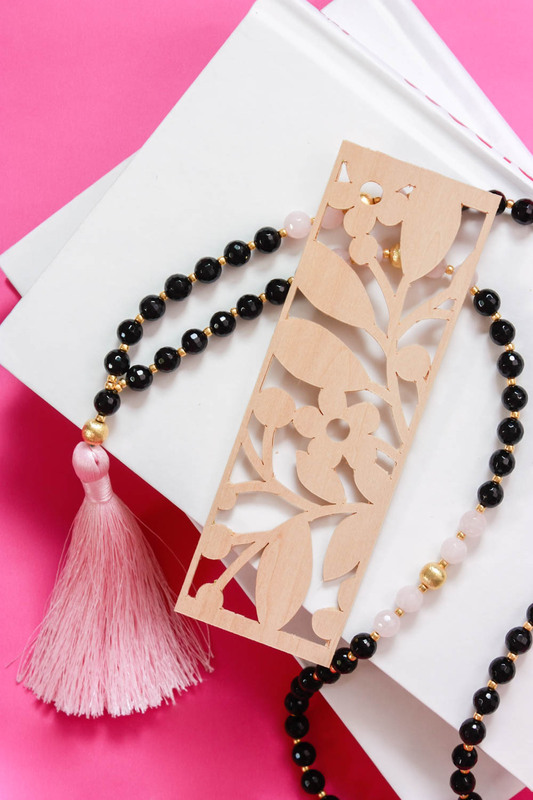 The main thing with designing these bookmarks, is making sure all the pieces stay connected. The pieces have to be connected so your bookmark is one solid piece. You can cut out and enjoy my design or make one of your own! Click here to see more of my Cricut Projects!